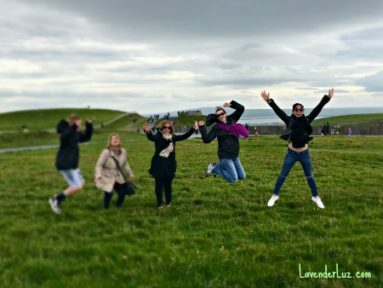 Earlier this month, Roger and I boarded a flight with our two teenagers for a family trip to Ireland. Once in Dublin we met up with my husband’s father and sister. We were three generations ranging in age from 14 to 81 (at any point in time, you can bet that someone had to stop for something). Through AirBnB we started out in a gorgeous penthouse apartment in Dublin 8, right near the Guinness storehouse. 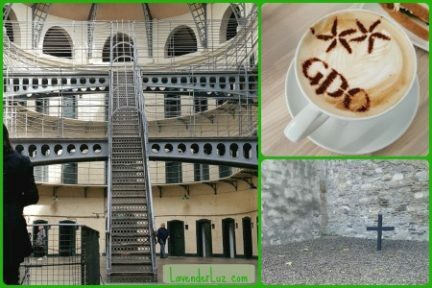 We toured Dublin Castle, the General Post Office (destroyed after being used as a base of the Easter Uprising in 1916), and Kilmainham Jail (Gaol), where the Irish Nationalists of the Uprising were executed the following month. Kilmainham Gaol (jail), General Post Office, execution site at Kilmainham Gaol. Next we traveled NW to the county where my father-in-law’s people are from: Sligo. Again, we hit the AirBnB jackpot with a Pat and Janet, lovely people who opened to us their home in a field across from Yeat’s grave and an 11th century round tower. Scene from our AirBnB’s patio: round tower, St Columba’s Church, grave of W. B. Yeats. 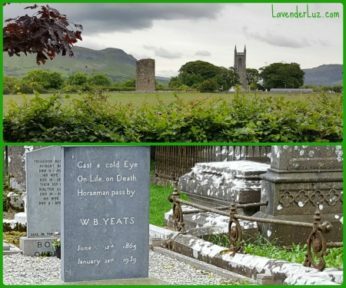 After driving near the adoption-infamous Tuam, we traveled to Galway to meet up with family friends who toured with us the rest of the trip. Here we ate and drank (not too much!) and walked the city and listened to live traditional music. 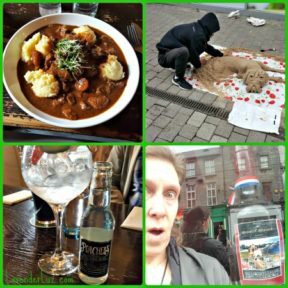 Irish stew, sand artist, the biggest bottle of wine I ever saw, craft gin and craft tonic. I didn’t know that craft gin is as big in Ireland as craft beer is in Colorado. Craft gin — and craft tonic — were offered by localities everywhere we went. I am forever ruined for grocery store tonic. The panorama setting on my phone camera can’t do the scene justice. I’m second from right doing a funky hurkie. At our final stop, Bantry, we enjoyed amazing hospitality of family friends. 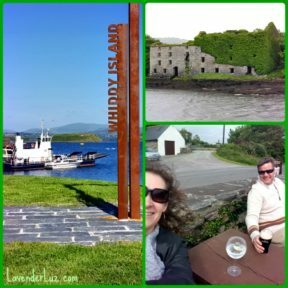 One of our perks was a ferry ride to nearby Whiddy Island. Gorgeous day on Whiddy Island; nature reclaims an old mill; Guinness for him. Cork gin for me. Then back to Dublin for our trip home. It was a grueling 28 hours in transit to Denver, thanks heat wave that cancelled flights, and while it was good to be in Ireland, it was also good to be home. Which is the mark of a good trip, no? If you are a true hibernophile and haven’t gotten enough here, I’ll be posting more pix on Instagram. Feel free to follow along. Wishing you well wherever your summer takes you. You can really see why it’s called the Emerald Isle, no? How wonderful! Love the photos, and I’m off to check you out on Instagram. 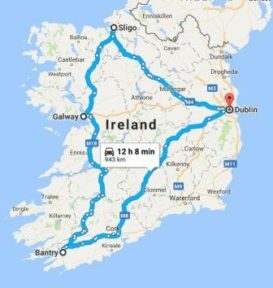 I have Irish ancestry (though about 5 generations back) and an Irish last name, and Ireland is firmly on my list of places to go. I actually said to my husband last night that we need to bring it up higher on our list. Sympathies on the long trip home. I know what those are like! But yes, they’re always worth it. I’m eager to see your travels on Instagram, Mali. Yup, always worth it. The cancelled flight isn’t what we’ll remember (much). It’s the rest of the stuff that family travel memories are made up. Oh, gorgeous! I love the Cliffs of Insanity and your jumps. Who knew, gin? Welcome home, what a great trip. I would love to go to Ireland, my grandmother’s family was from County Cork. I love vicariously traveling through your pictures (and without the long flights, across a big ocean at that…)! What was your grandmother’s family name? There’s a good chance that the people we stayed with there knew of your grandmother’s family. It seems like such a small world there. What a wonderful trip! Glad you were able to do this with family and have such a wonderful adventure. Though am sad it means you won’t be out my way this summer (sniff, sniff). So pretty! I love Ireland itself, but moreover, I love seeing it through your eyes. It sounds like an amazing trip; one all of you will remember forever. Sounds like such a wonderful trip. It’s one place I’ve always wanted to go. Have a great rest of the summer. That looks like so much fun! Now I really want to go there! someday…. Delighted you enjoyed our lovely country. Funny, I’m Irish and I have a brother in Colorado! Ireland is definitely on my travel bucket list. 🙂 I am 1/4 Irish, with roots (that I’ve discovered so far) in counties Cavan, Armagh, Wicklow and Leitrim.